Open outcry is a trading method used in futures pits and stock exchangesStock ExchangeA stock exchange is a marketplace where securities, such as stocks and bonds, are bought and sold. Stock exchanges allow companies to raise capital and investors to make informed decisions using real-time price information. Exchanges can be a physical location or an electronic trading platform. where traders use verbal and nonverbal signals to communicate. Before the advent of electronic trading, nearly all financial trading was conducted via open outcry. This is the picture people see of stockbrokers on TV shouting and using hand signals, looking as if there’s a squabble in their midst. 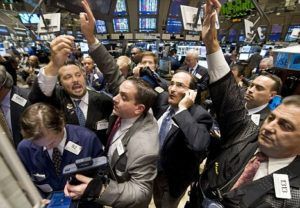 While stockbrokers yell how many contracts are for sale and at what price, they also need to use hand gestures in order to get through to one another despite all the screaming. The open outcry method is effective in that it makes possible a structured process that ensures bids and offers are efficiently matched. The open outcry method has been around for quite some time and is considered the most effective way of buyer-seller matching. The setting is very personal, as traders come face-to-face with each other. With that, each party is given the opportunity to read each other’s body language and incorporate it into their decisions. The palms of the hands are very important in buying or selling stocksMarketable SecuritiesMarketable securities are unrestricted short-term financial instruments that are issued either for equity securities or for debt securities of a publicly listed company. The issuing company creates these instruments for the express purpose of raising funds to further finance business activities and expansion.. Whenever a seller wants an offer to buy, the palms of the hands should face towards the buyer. Conversely, a buyer searching for a seller, has his palms facing inward, toward his body. The number of contracts being sold can be indicated using the trader’s fingers. For numbers 1 through 9, the trader touches his chin. When the quantity is in multiples of 10, he touches his forehead. And for multiples of 100, the trader touches his forehead with a fist. The hand signal that is composed of the fist against the palm signifies STOP. It means that there is a stop order because the price’s already reached a specific level, compelling the broker to immediately trade for the best currently available price. When a trader places his or her hand across his or her throat, it means that the order’s been canceled or already filled. Regarding trading options, traders must indicate whether the option is a call or a put by using their hand. A put is signaled with the hand forming what looks like the “OK” sign while a call is signaled by the hand forming the letter C.
The open outcry method makes it possible for traders to actually see each other and gain access to facial expressions that reveal a lot about the concerned parties. More specifically, traders look for emotions like greed and fear, something that cannot be seen in electronic trading. The noise that is heard and seen in the pit helps traders determine the volatilityVolatilityVolatility is a measure of the rate of fluctuations in the price of a security over time. It indicates the level of risk associated with the price changes of a security. Investors and traders calculate the volatility of a security to assess past variations in the prices of the market. The trading market serves as a great experience for new players who want to enter the business. There’s a lot of discussion going on as to the differences between open outcry and electronic trading. Some traders say that electronic trading is better than open outcry because it gives better access to the marketplace, allowing for more transparency in terms of the bids and offers. Also, since it is electronic, traders can look into the history of the market from anywhere they are. In terms of the length of time it takes for trading to occur, electronic trading is more time-efficient. What usually minutes in pit trading can be finished in just seconds in electronic trading. Electronic trading makes documented trade records easier to keep. Every order, optionOptions: Calls and PutsAn option is a form of derivative contract which gives the holder the right, but not the obligation, to buy or sell an asset by a certain date (expiration date) at a specified price (strike price). There are two types of options: calls and puts. US options can be exercised at any time, or contract is documented and is accessible from wherever one is. There are no worries about orders scribbled down incorrectly or order sheets getting lost in the shuffle of trading. Thank you for reading CFI’s explanation of Open Outcry. CFI is the official provider of the Financial Modeling and Valuation Analyst (FMVA)™FMVA™ CertificationThe Financial Modeling & Valueation Analyst (FMVA)™ accreditation is a global standard for financial analysts that covers finance, accounting, financial modeling, valuation, budgeting, forecasting, presentations, and strategy. certification program, designed to transform anyone into a world-class financial analyst. Overweight StockOverweight StockAn overweight stock is a stock that financial analysts believe will outperform a benchmark stock, security, or index. The overweight recommendation signals to investors to devote a larger percentage of their portfolio to the stock. Hence the term "overweight". Six Essential Skills of Master TradersSix Essential Skills of Master TradersJust about anyone can become a trader, but to be one of the master traders takes more than investment capital and a three-piece suit. Keep in mind: there is a sea of individuals looking to join the ranks of master traders and bring home the kind of money that goes with that title.